Assistant league Tulsa’s 2018 Style Show featured fashions from our Bargains Thrift Shop. Held at the Club at Indian Springs, the show’s theme was bags. Handbags of every size, shape and color accessorized outfits ranging from casual to formal. Models from our jewelry department interpreted “bags” in a unique way! Phyllis Dotson has story after story about children in Tulsa. It can be heartbreaking. A boy who didn’t have any underwear. Siblings who took turns wearing the one coat they owned. Those who didn’t have socks and very little clothing. Dotson doesn’t get down about it. She does something about it. 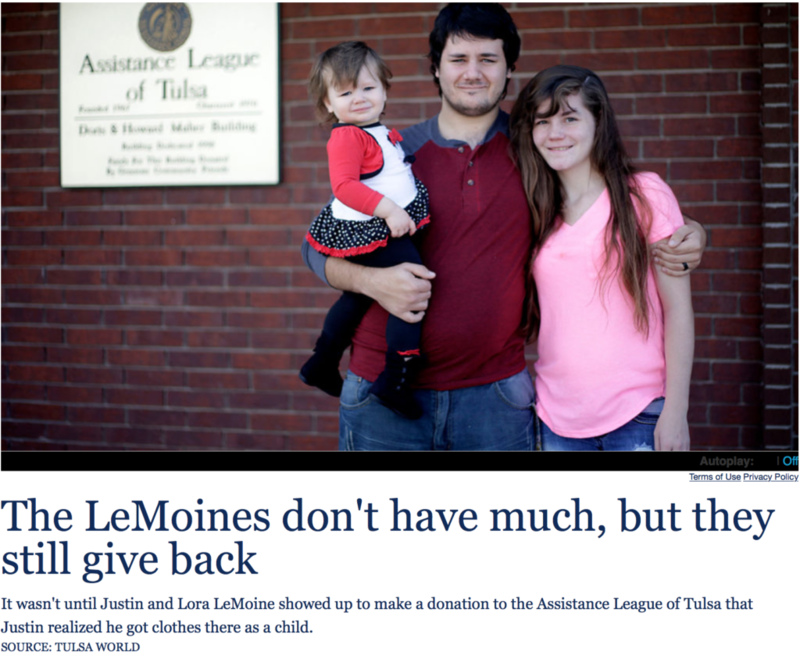 Through her volunteerism with the Assistance League of Tulsa, she has literally helped put clothes on the backs of low-income children. She has helped eligible students brought to the organization to shop for new school clothes. She has worked the cash register at the nonprofit’s Bargains Resale Shop, which provides income for the programs. She’s done everything in between. This enthusiasm is surely part of why the Assistance League is bucking a trend. At a time when many area nonprofits are reporting financial difficulties, the organization has posted record revenue. In one year, its income jumped 43 percent to $911,000. That’s the paradox about social programs. When the economy is slumping, needs go up but donations are harder to get. Nonprofit budgets with state and federal grants are reporting losses. Oklahoma’s multiple revenue failures and the federal government’s changing priorities have meant cuts to agencies’ funding. The Assistance League doesn’t receive government money. It isn’t part of the United Way, either. The 46-year-old nonprofit exists through its memberships, income from its Bargains store and private donations. It doesn’t hold events but does ask for money, and it strives to be strategic for efficiency. Dotson and other volunteers often write personal thank-you notes to those who support the agency. The group had 42 new members join last year, which its national organization says may be the biggest jump of any of its chapters. The Assistance League of Tulsa has 230 active members. Dotson, a former president of Helmerich & Payne International Drilling Co. and vice president and director of Helmerich & Payne Inc., said the options for volunteers are stress-free, including not having a required amount of hours. Its mission is simple: provide clothes to children in families who cannot afford it. The Assistance League’s signature program is Operation School Bell. This year, 1,490 students at Tulsa Public Schools will be clothed through the program, in addition to 1,205 students in suburban schools. In the suburban areas, arrangements are made for volunteers and students to meet at Walmart stores to shop. In addition, similar programs are available for middle and high school students. All students are referred to the program by the school counselors from 14 school districts. The Betty Bradstreet Assistance Fund provides at least $45,000 in grants to teachers. Many Assistance League members are former educators or in some way associated with education. Atcheson taught in TPS for 38 years, retiring as principal at Lee Elementary. Outgoing president Marsha Darden is also a former educator. Financially, the nonprofit has a diverse income base. Last year, about 37 percent of its revenue came from the resale shop. The rest broke down by 25 percent in grants from private foundations, 13 percent from investments, 13 percent from a letter campaign and 12 percent from unrestricted donations for Operation School Bell. Nearly 85 percent of income goes directly to the programs benefiting children, officials said, and the other 15 percent is used for operational costs of the store, warehouse and building. No one is paid. The proportion going to programs is a far cry better than the 60 percent recommended by the national group. 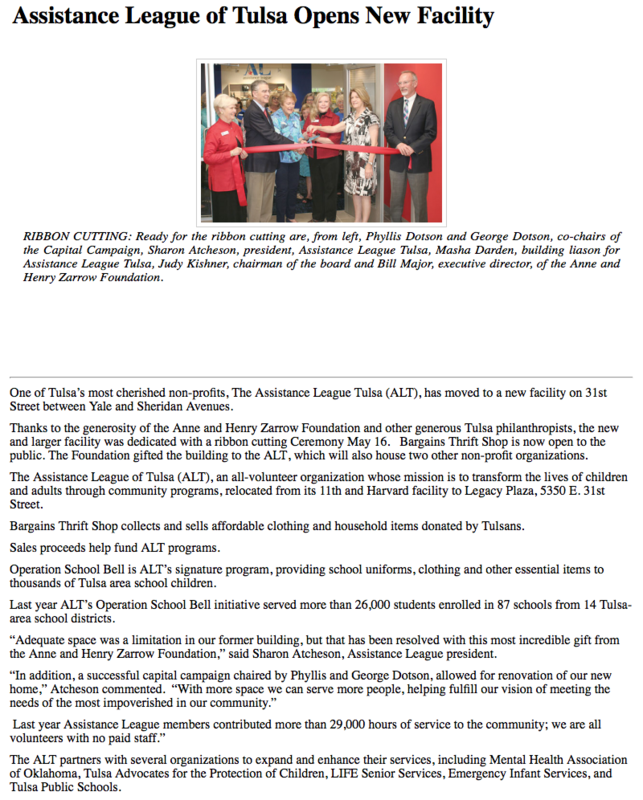 The Assistance League of Tulsa will be moving next spring from its location at 3408 E. 11th St. to Legacy Plaza, on 31st Street just east of Yale Avenue. It will be neighbors with other nonprofits including the Community Action Project of Tulsa, Mental Health Association Oklahoma, Oklahoma Center for Nonprofits, LIFE Senior Services and Vintage Housing. The capital campaign of $5.5 million for the move has been reached. The Bargains store will move, too. Its chic appeal has been popular with the younger clientele and those looking for a bargain. 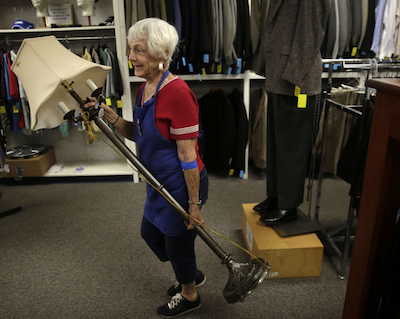 Items for the thrift boutique are donated from stores, estate sales and individuals. Anything not used or sold gets donated to a partner social service agency. Social media has also generated customers by showing off models in outfits, highlighted on Facebook, Twitter and Instagram. When asked how the Assistance League has managed to be so successful in difficult economic times, Phyllis Dotson had a simple answer: “We have a very committed group”. 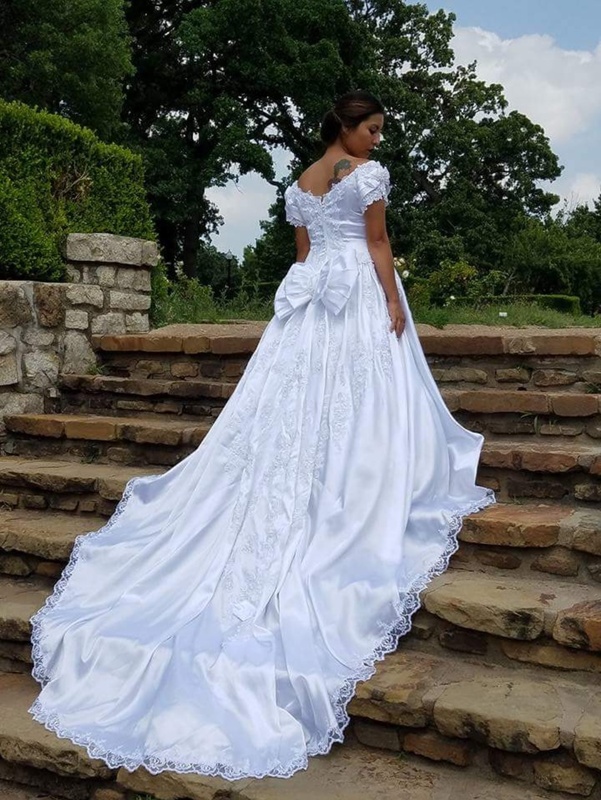 A few months had passed since spending $600 on a wedding dress, when trying it on a few weeks before the wedding, she could barely get it zipped because she bought it fitted, nonreturnable and unalterable. My sister was in a panic seeing her daughter cry. She absolutely didn’t know what to do since they Couldn’t afford a new dress at this late date. I mentioned that I saw a dress at Bargains but knew nothing about it except that it was absolutely stunning. We drove over to look at it and the bride fell in love. It was priced at $65.00 but there was an additional 50% off that day, so we got it for $37.50 + tax. Dress and Veil. UNBELIEVABLE! We just had to have it taken up in a few places and she looked like a princess walking down the aisle. There is no way our family would have EVER been able to afford such a dress. It was clear this dress would have cost in the thousands originally. All I can say, is Bargains came through for our little humble family once again. You could not have scripted a more perfect wedding from beginning to end. Endless thanks from our family to my family at Bargains.